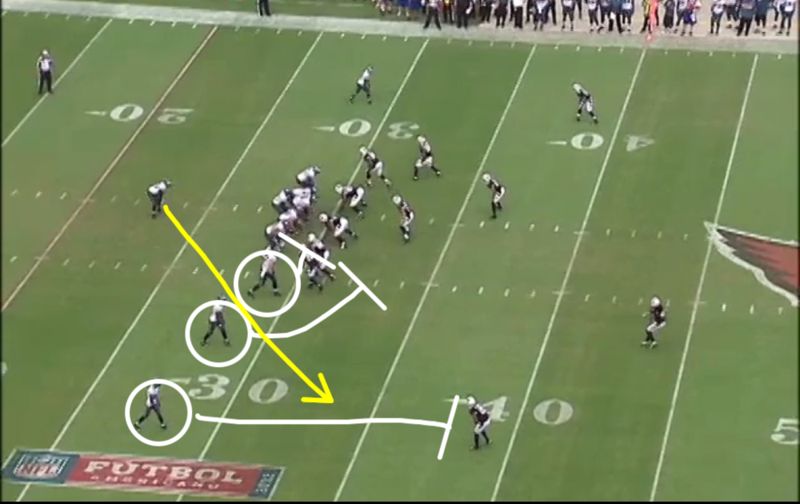 Yesterday I talked about the Eagles defense against the Cardinals (and specifically Larry Fitzgerald). Today, let's look at a few other odds and ends from that game. First up: Michael Vick has lost a step or two. The other day I went back and watched some tape from his glorious 2010 resurrection season. A year after coming back from prison, the athletic wonder looked as fast as ever. His stop-starts baffled defenders and his top speed rivaled most any player in the league, at least to my eyes. Whether he was still at the sub-4.4 forty of his youth I can't say, but he looked close. Vick is still plenty athletic. He's easily faster than 95 percent of quarterbacks in the NFL. But he's lost that extra dimension of speed that used to help him escape a few more rushers and shoot by a few more would-be tacklers. His escape ability is noteworthy, but we may not be able to classify it as "dangerous" any more. That's obviously not a positive development. Finally, I want to highlight two plays by defensive tackle Cedric Thornton. 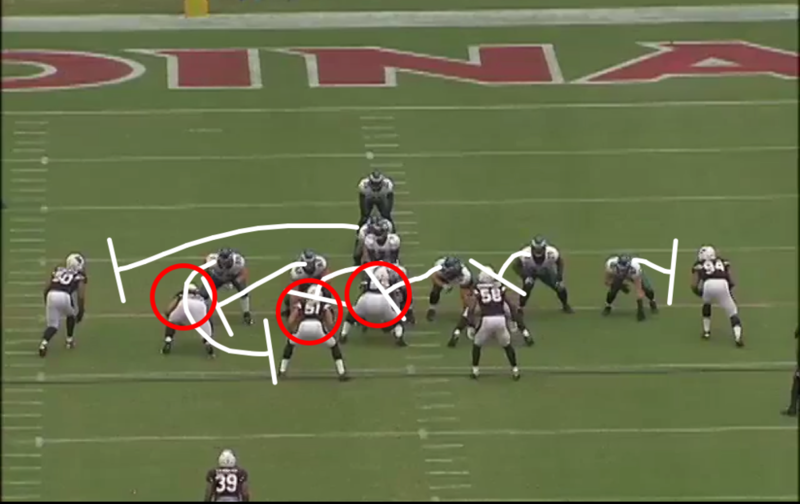 With Fletcher Cox sidelined for part of the game with a migraine, Thornton got plenty of snaps. He's still an inconsistent player, but by far his best move is that powerful bull rush. 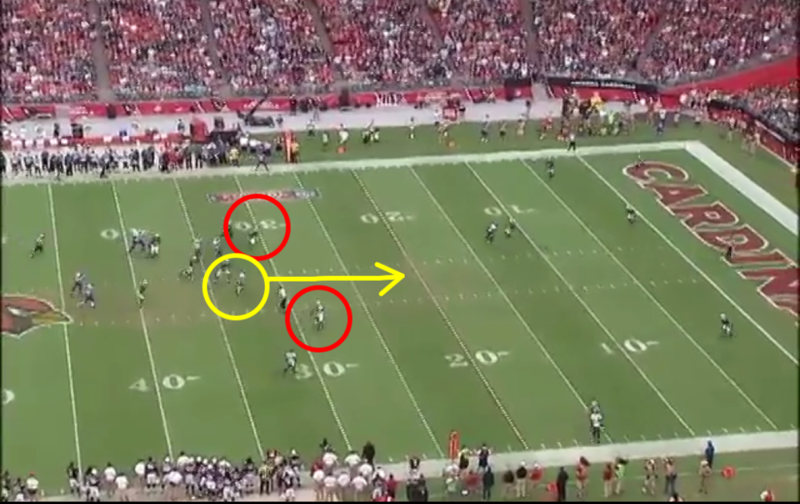 On the first play, he pushed the guard right back into the quarterback's face as Brandon Graham beat his blocker off the edge. On the second, Thornton's bull rush busted up a run that was supposed to go through the middle. Well done. Tagged with Arizona Cardinals, Philadelphia Eagles, NFL, All-22, Daryl Washington, Week Three, Run Blocking, Andy Reid, Cedric Thornton, Michael Vick. September 26, 2012 by Brian Solomon.